When I was younger, I had a crappy little electronic game in which I controlled a car driving down the highway. I had a little wheel that could turn the car left and right, kinda, and I was supposed to avoid hazards. It was apparently the world’s worst-maintained highway because every 10 feet, it was like, barrel, barrel, squirrel, bush …. There were bushes growing on the highway. 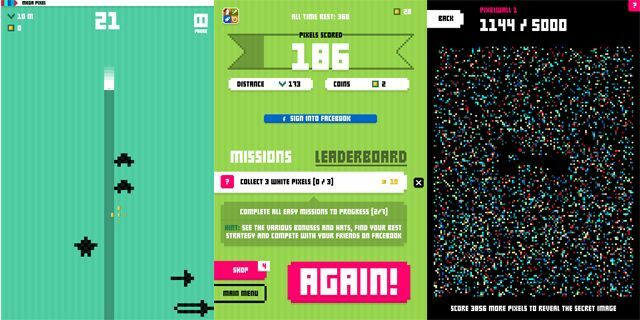 Anyway, Mega Dead Pixel, a new free-to-play title from developer About Fun Games, reminds me a lot of that game, and not just because they have about the same complexity of graphics. It’s also equally moody and just as frustrating at times. 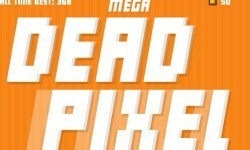 Mega Dead Pixel is an “endless faller” (the endless runner’s oddball cousin) in which you control a single pixel dropping through space FOREVER. You earn points by “painting” the assorted objects you pass, and you do that by coming within a single pixel of hitting them. You move by tapping the left and right sides of the screen to scooch over one pixel at a time, or you can hold to cover more ground faster. And that’s kind of where the game falls apart: It requires so much precision to play well, and the touch controls aren’t quite up to helping you out with that. It gets easier over time, but your first few rounds are going to be embarrassingly short as you run into objects you thought were farther away and straight-up murder your poor little pixel. Still, it’s a quick game with a cute art style and an amazing retro-style soundtrack. If you have the patience, it’s worth the effort. The Bad: …as long as your patience with the imprecise controls and steep learning curve hold out. The Verdict It’s the most unforgiving free-to-play game I’ve ever seen, but I respect it for that.